Higher - Quicker - Further - Spice up your day! Chilli Pro Scooters builds stunt scooters for your every day adventure and beyond. With the sleekest designs and some of the toughest materials available, yet at a reasonable price. 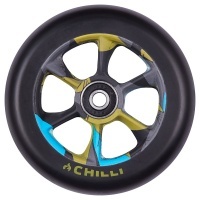 The Turbo Wheel from Chilli is a hot and spicy, handmade piece of art, at a great price. With the core of this wheel looking exactly like a super sick turbo charger, we love it! 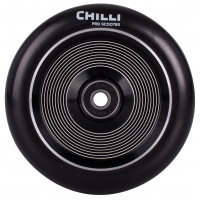 The Thunder Wheel from Chilli is a hot and spicy, handmade piece of art, at a great price. Hollow in its core, this wheel is super lightweight but doesn't compromise in strength.